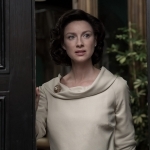 Outlander 3.3 “All Debts Paid” review: Claire and Frank have breakfast and when Claire asks Frank to go see a movie, he has already seen them. Frank feels bad, but they have an agreement. John Grey (David Berry) arrives at Ardsmuir prison. 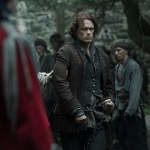 While given a tour, he is told of Red Jamie, called the MacDubh, the leader of the prison, who keeps them all in line. He says to dine with him once a week. He seems familiar to Jamie, and he talks of it with Murtagh (Duncan Lacroix), who is very ill. He is reminded of Claire, even in the prison. Grey sends for Jamie. They stand eye to eye, taking the measure of each other. Claire graduates from medical school. At her party, she accidentally meets one of Frank’s indiscretions, when the girl comes to the door after Claire was already supposed to be gone. Where’s a good cell phone when you need one? He comes home drunk and they argue. Menzies is brilliant in this scene, “I think our bedroom is far too crowded already. Wouldn’t you agree?” She tells him to divorce her. He won’t because of Brianna. The British find a man talking crazy about cursed gold. Grey wants Jamie to translate. He declines but Grey says he’ll take the chains off. Jamie negotiates for medicine for Murtagh. The man confesses all, and it doesn’t make much sense, but raves about the White Witch. Murtagh and he talk of Claire and the stones. Jamie dines with Grey and he brings up his wife again. They dine pleasantly and Jamie describes it to the prisoners. He is able to secure permission for the men to set out snares for their own food. While they are out, Jamie escapes and swims for the island to “see for himself” about Claire. There is a search but Jamie comes back, taking Grey unawares, reminding him of a promise to kill him. Grey refuses to Jamie’s dismay. He explains why he left – to see about the white witch. Brianna graduates from high school and her parents are immensely proud. Frank wants to take Brianna to England without Claire. Oh, and by the way… he also wants a divorce. Claire: “You’ve been waiting for the clock to run out.” It’s true. 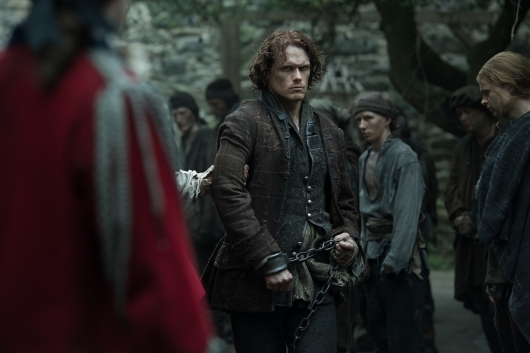 Jamie is separated from Murtagh and the other prisoners by John Grey. Grey takes him to work for a family, where he will check in on him, basically gifting him with his freedom. The obvious running theme in “All Debts Paid,” is just that, as John Grey and Jamie are finally square, as are Frank and Claire. And at the end he asks for a divorce, his deal done. Then he dies – Claire is free as well. Frank Randall is perhaps one of the most tragic characters on television. Born with an evil face, he never had a chance at regaining his wife’s love after she returned physically, but not emotionally. He loved his daughter (his daughter in every single way except physically) completely, and she in turn, loved him best as well. He was confident she would choose to live in England with him. He was not wrong. Frank was finally going to be free from his obligation, and divorce Claire and remarry a wife who could love him, when he died of a car accident (alcohol a probable cause). Claire said her goodbyes to him, but alas, poor Frank. Although watching this story unfold on television does have some differences than the novels, I feel like it only enhances the story, and makes one analyze the story choices as compared to the previous ones. This episode was wonderful. I enjoyed the budding friendship between John Grey and Jamie this time around as well. And Balfe and Menzies played marital strain to perfection. Outlander airs Sunday nights at 8:00pm ET on Starz.